Sloane & Company is bolstering PR for activist hedge fund Sandell Asset Management as it ratchets up pressure on furniture maker Ethan Allen Interiors. Sandell, which owns about 5.5% of the publicly traded company, claims Ethan Allen is significantly underperforming industry peers like Basset Furniture, Knoll and La-Z-Boy, among others, and is urging a sale to a private equity firm or recapitalization of its real estate assets, which Sandell claims are worth $450M. The hedge fund says it is prepared to mount a proxy challenge but prefers to re-engage in talks. 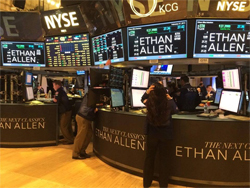 Danbury, Conn.-based Ethan Allen initially moved up the date of its annual meeting to mid-October, but last week said it would revert back to a November date. "While the company's board had no indication that any shareholder planned to submit nominations or proposals, we do want to ensure any shareholder has the opportunity to do so and are pleased to reschedule the meeting to November 24, 2015," EAI chairman and CEO Farooq Kathwari said in a statement. The company posted fiscal 2015 revenues of $754.6M and net income of $37.1M. Sloane CEO Elliot Sloane and managing director Dan Zacchei are advising Sandell on the PR front. Okapi Partners is working the proxy beat. Corey Whitley, EVP and CFO, heads Ethan Allen's IR.